For emergencies, please call the NOC at 225-578-6621. 2. Login to Footprints using your myLSU ID (Paws ID). You will then be directed to the below screen. 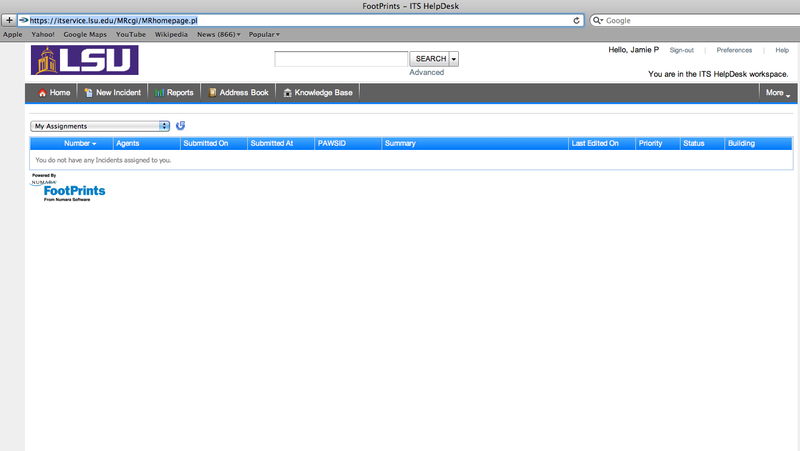 Note: If you are not brought to the ITS HelpDesk Screen, you will have to redirect to this page. 3. 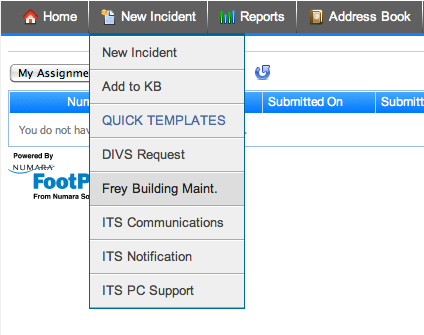 Select New Incident on the toolbar next to the Home icon, and on the drop down that comes from that tab then select Frey Building Maint. 4. A window will pop up. In the pop up window, type in a brief summary after Frey Building Request: and enter in you myLSU ID (PAWS ID). 5. Under Contact Information fill in all the information marked in red. Note: all red fields are required. 6. Scroll down and click on Frey Building Requests to expand the tab. 7. Select the Request type. 8. Type a detailed description of the problem; and then type in your room number and cubicle number. 9. Click Save at the bottom to save and submit your requests to the building managers.